Imagine if you could only live one third of your life? This is the case for Lizzie. She has two sisters who look identical to her, but they’re not triplets, they’re clones. The girls are the result of a successful attempt at cloning humans. The girls spend their younger years as triplets, but as they get older the truth behind their conception comes to light, and for their own safety the three girls must live as one person, Elizabeth. They literally live one third of a life, one sister (Lizzie) goes to school in the morning, comes home at lunch time, switches over to another (Ella), who comes home later afternoon where the last sister (Betsy) takes over for the night shift. There are some difficulties with this situation, but the girls have always managed to figure out ways to make it work, then a problem rears its ugly head in the form of a boy! Well two boys to be precise. Sean and David. Lizzie wants to date Sean Kelly, but Betsy wants to date David Chancellor, but as there is only one Elizabeth, they can only date one boy. It’s this hiccup that starts the girls thinking about their existence and digging further into the real reason they’re living as one. 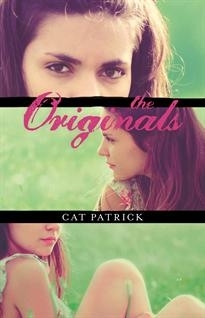 I love Cat Patrick and this book like her others, did not disappoint. I love that Cat Patricks' books make you think and question, but at the same time they are entertaining stories about believable characters.